Located on the shallow waters of the Arabian Gulf, Khobar Water Tower is an iconic structure and looks mesmerizing specifically during the night. The top floor of the tower features a huge restaurant overlooking the beautiful water from where visitors can view the entire city. The tower also houses a water reservoir that supplies water to the city. The tower, with its astonishing lighting, is worth a watch when in Al Khobar. 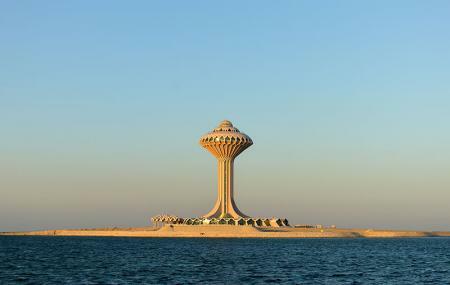 Iconic symbol of AL KHOBAR city. Light & music activities there. Fireworks are lunched from it. Relaxing seafront. Nearby kids playgrounds. Walking track towards water tower is best place to wall at night/morning. One of Top attraction in Al khobar.